Chlorinate your hands: Sounds a little harsh but it is actually not. Chlorine is used to purify drinking water and so, you can safely use it on your hands. It is readily available for purchase. Add some chlorine to hot water. Make sure that your hands can tolerate the temperature. Dip your hands for a couple of minutes. During these two minutes, your hands will itch and irritate you a bit but will not harm you. It hastens the fading process. Bleach your hands: You can bleach your hands using the bleach that you use on your face! It is safe. Again, bleaching will also irritate your hands a bit because of ammonia present in it but that is not a lasting problem. Once the bleach is dry, rinse off your hands properly. Avoid eye contact with your hands before washing off. Rinse off your hands thoroughly and then soak them in cold water for quick relief from irritation. Bleach can fade out the color quickly. 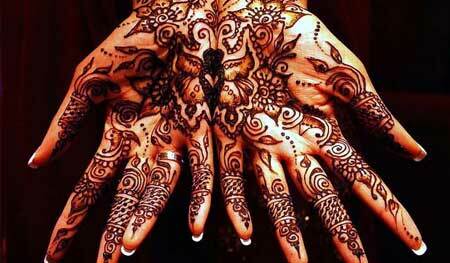 Go gentle with olive oil: This is a perfectly gentle emulsifier for fading out the mehndi color. Swipe a cotton ball soaked in the oil across your hands. Adding some table salt to the oil is also a good idea because it contains chlorine and can speed up the discoloration process even more. Apply every three to four hours each day for a few days. Wonders of lemon and baking soda: Create a paste using lemon juice and baking soda and dab it on the colored areas of your hand. Leave it for 10 minutes and then gently scrub your hands with a loofah for some time to properly exfoliate your hands. Remember that scrubbing should be done is a circular motion. Use warm water to rinse off your hands. You can experience some dryness on your hands. It is normal. Just apply some moisturizer. Hydrogen Peroxide works too! This compound is known for its skin lightening properties and helps to remove mehndi color. It is gentle and safe and easily available in medical shops. It works well with all skin types but still to ensure its safety, run a test on a small patch of skin. Avoid using if you see unwanted results and consult your doctor immediately.